Me and my friends (that's some good grammar there, it just sounds weird saying "my friends and I" - I'm aware of the error, let's move on) over at the Blended Blog have a new series we're uber excited about: Style Perspectives. It all starts THIS coming Wednesday all the way until June!! The deets: all the prompts are below. 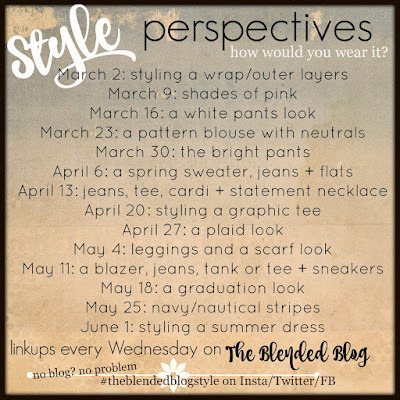 Each of us at the Blended Blog picked our prompt for our week and everyone is going to style it their own way. You'll be seeing 14 different outfits with the same prompt every week! Our group has a wide range of ages/occupations etc so it should be interesting. The 'host' each week will post on the Blended Blog and each of us will post our interpretation on our own individual blogs. The best part? YOU can join in with us and add to the fun by linking up with us!